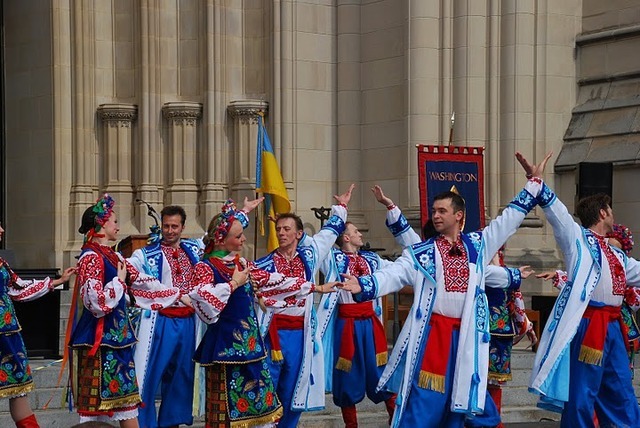 Ukrainian Orthodox Church of the USA - 71st National Cathedral Flower Mart! 71st National Cathedral Flower Mart! 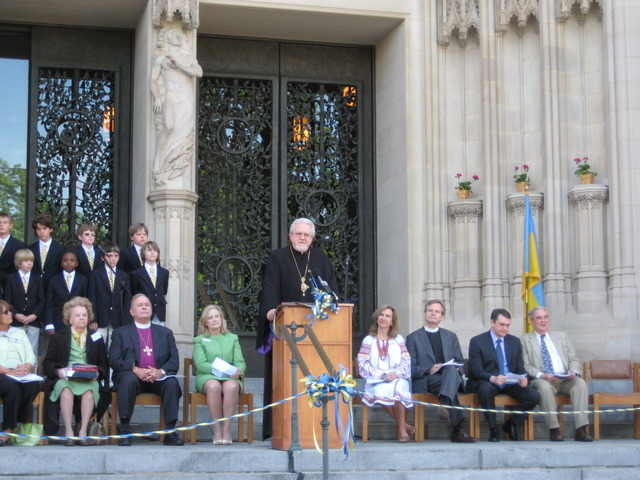 May 7-8, 2010 – A spectacular DC annual outdoor festival – the 71st National Cathedral Flower Mart – was held during the two days on the grounds of the Cathedral honoring Ukraine as the featured nation of the year. 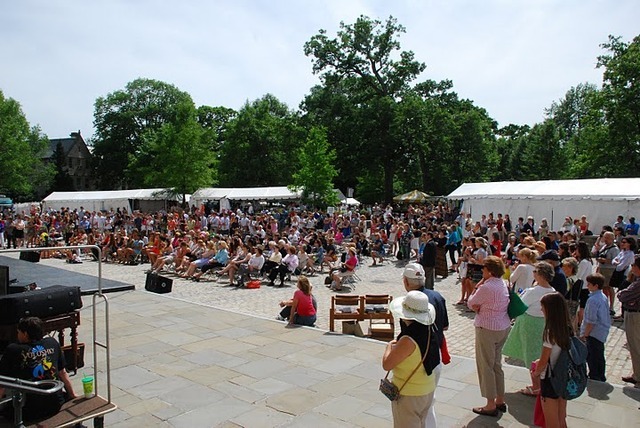 The event is sponsored by the All Hallows Guild of the Cathedral, which is an all volunteer group of Cathedral members and friends whose sole responsibility is the beautification and maintenance of the fifty seven acres of gardens and landscaping surrounding the National Cathedral. 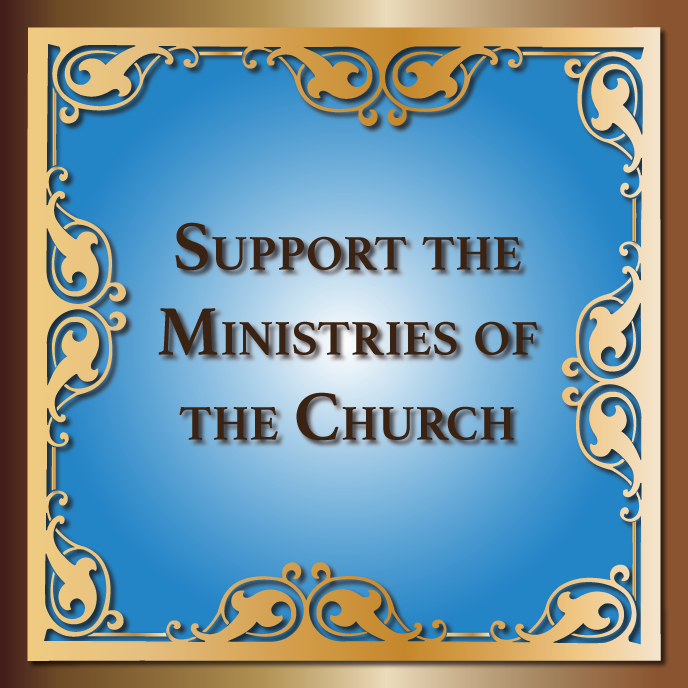 The National Cathedral is an independent Church of the Episcopal Christian denomination. 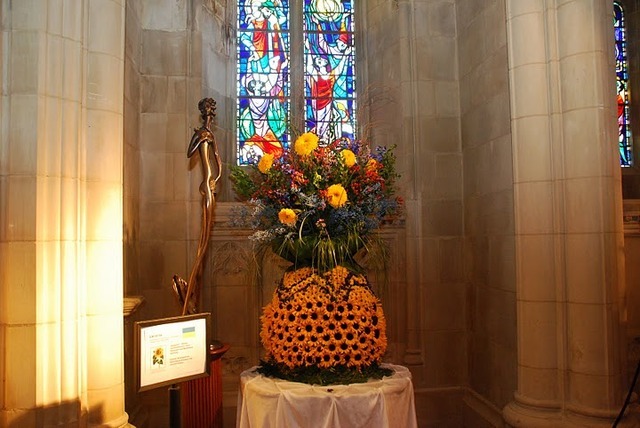 Each year embassies and international floral designers participating in the Flower Mart produce extraordinary displays of floral arrangements native to the nations, which are displayed in the interior alcoves of the Church itself with one of the embassies selected as the honorary chair and the featured nation. The opening of the event was attended by the honorary guests among who were Ambassador of Ukraine to the USA Oleh Shamshur, the second Ambassador of the USA to Ukraine, William Miller, the National Cathedral Dean Samuel T. Lloyd III and Rt. Rev. Episcopal Bishop John Bryson Chane, D.D. of Washington, D.C, Most Rev. Archbishop Antony of the Ukrainian Orthodox Church of the USA and Chairman of the 2010 Flower Mart Lydia Chopivsky-Benson. 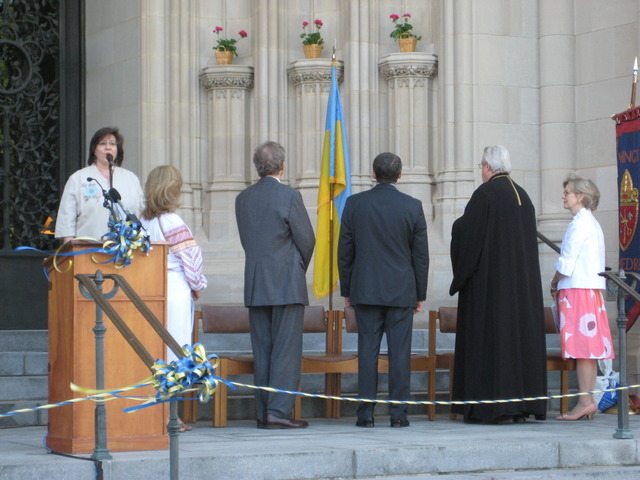 Natalia Honcharenko, Director of the Museum of the Ukrainian Orthodox Church of the USA in memory of Patriarch Mstyslav I, sang the Ukrainian National Anthem for the opening. Archbishop Antony greeted the guests in the name of our Church, thanking the All Hallows Guild for honoring Ukraine as the featured nation of the Flower Mart, reminding the guests that for the past 400 years – under the Tsarist and Communist regimes – Ukraine was forced to suppress the expression of her own identity, but during this festival she was able to shine, as she has since the break-up of the Soviet Union. 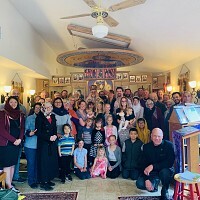 The Archbishop expressed the gratitude of many parishes of the UOC of USA, which, during their formative years were welcomed into established Episcopalian parishes and offered a place to worship, in some cases for many years. He stated that during the 100th anniversary celebrations of the UOC of USA in 2015, this Christian kindness will be remembered and celebrated. 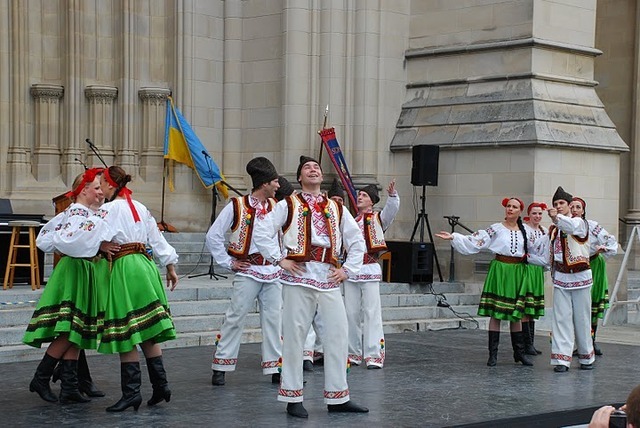 During the festival visitors enjoyed a diverse program featuring the Voloshky, Syzokryli and Fantaziya Ukrainian Dance Ensembles, along with renowned violinist Vasyl Popadiuk, among others. 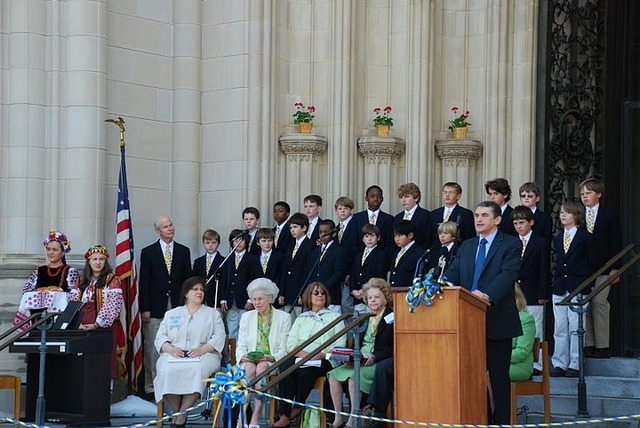 Also featured were the student choirs of the National Cathedral boys’ and girls’ schools located adjacent to the Cathedral. 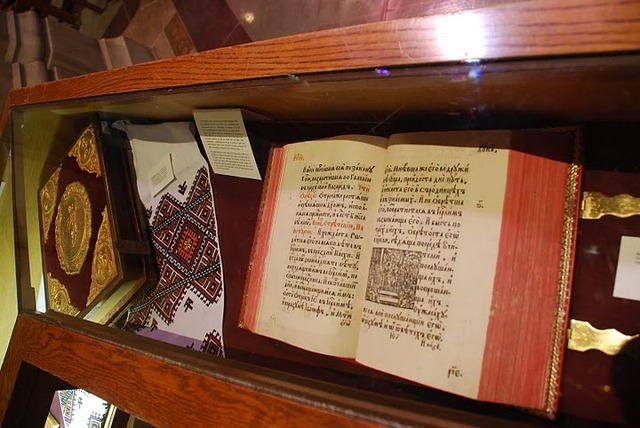 Of special note was the exhibition inside the National Cathedral of items from the Ukrainian Heritage Museum of New Jersey in memory of Patriarch Mstyslav I – of the Ukrainian Orthodox Church of the USA. 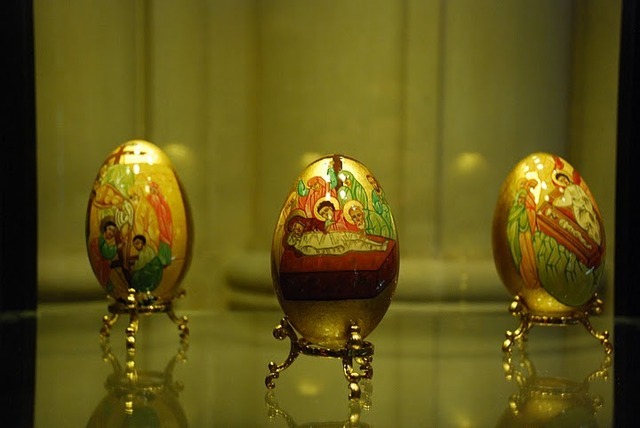 The exhibit featured "Liturgical Treasures of Ukraine": icons, crosses, miters, and other liturgical items, along with a themed collection of pysanky with Biblical scenes from the Holy Supper through our Lord’s Resurrection. It was a display viewed by thousands of people who visited the Flower Mart. 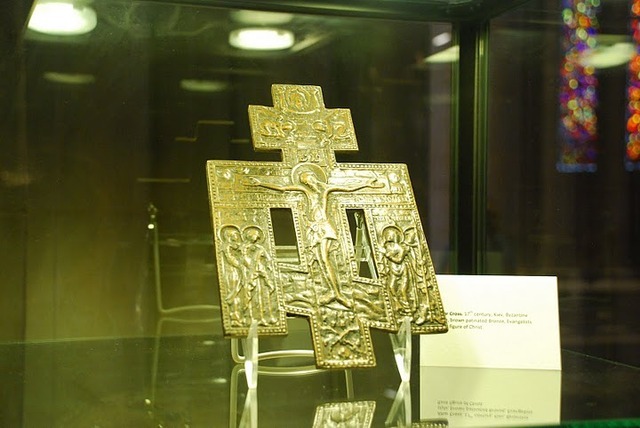 The exhibit was prepared by Museum Director Natalia Honcharenko, who was ably assisted by Tanya Tschaikowsky of St. Andrew Ukrainian Orthodox Cathedral of Metropolitan Washington in Silver Spring, MD. 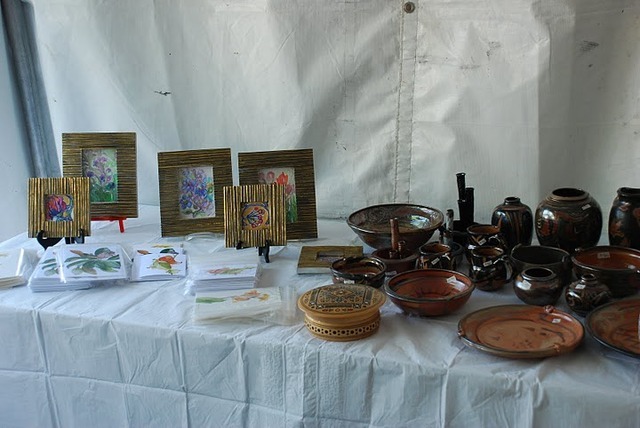 During the two-day festivities the Ukrainian Embassy had a tent where visitors could sample the rich and colorful culture of Ukraine through pysanka (Ukrainian decorated Easter eggs) demonstrations, exhibition of authentic costumes, carved wood and ceramic crafts and many publications – especially those featuring the thousands of tourist destinations found throughout Ukraine. 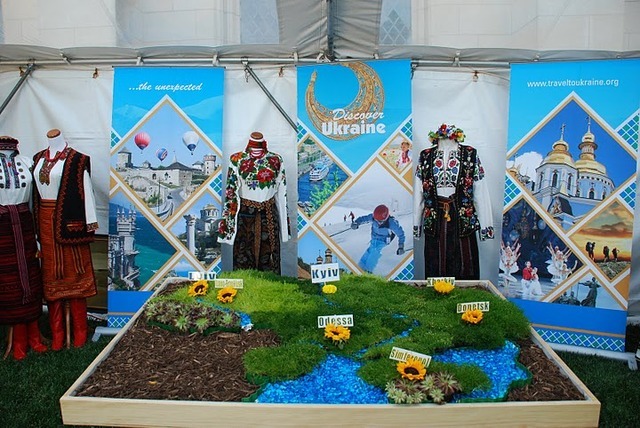 Special attention was drawn to a large map of Ukraine inside of the Embassy tent created of flowers and herbs to represent the different geographical regions of our country. IOCC Offers Volunteer Opportunity to Help Rebuild Homes on Gulf Coast!